The 27-panel exhibit documents the extent of U.S. humanitarian intervention during the most difficult years in the life of the newly formed Armenian state. Based upon the photographic collection of an American medical officer, Dr. Walter P. Davenport, the exhibit reveals the depth and breadth of measures taken by U.S. military personnel to stabilize the humanitarian crisis in Armenia, and especially the caretaking of the most vulnerable part of the population through hospitals, orphanages, food distribution points, and other facilities. The exhibit creates a panoramic view of the entire duration of the Armenian Genocide. All facets of the genocide that the photographic record allows, ranging from the deportations, executions, massacres, murders, starvation, extermination and destruction, are reconstructed per panel. 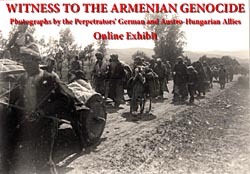 The exhibit also documents the immediate aftermath of the atrocities, attesting to the catastrophic ruination of Armenian society in the Ottoman Turkish Empire. With panels displaying photographs of survivors, rescued women, homeless children and refugees, the scale and depth of the uprooting of the Armenian people are revealed. 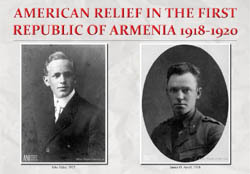 This exhibit reconstructs the story of the near superhuman efforts undertaken by John Elder and James O. Arroll to rescue Armenians from the many perils they faced during the 1918-1920 independent Republic of Armenia. 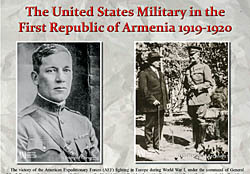 Arriving in Yerevan in January 1918 as representatives of the International Committee of the Young Men’s Christian Associations (YMCA), they soon found themselves in charge of coordinating the operations of all U.S.-based charities in the besieged young republic. The exhibit relies upon Elder's own words from his published journal, along with original records that he personally saved from the time of his service, and the photographs that he made and captioned. 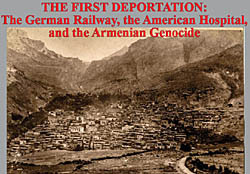 The city of Zeytun was the first Armenian community in Ottoman Turkey deported en masse in April 1915. Part of its population was routed along the Berlin-Bagdad rail line all the way to Konya, where an American hospital was located. 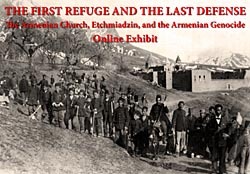 Based on the photographs taken by Dr. Wilfred Post, the testimony of Dr. William Dodd, and the efforts of Miss Emma Cushman, the exhibit reconstructs the fate of the Armenians in central Anatolia, far from the deserts of Syria. Retrieved from the United States National Archives, the entire set of photographs taken by Dr. Wilfred Post is being issued for the first time in this exhibit. The exhibit explains the importance of the Mother See of Holy Etchmiadzin during the Armenian Genocide and examines the vital leadership role played by the clergy during the Armenian Genocide, especially the all-important intervention of His Holiness Catholicos Gevorg V Sureniants in alerting world leaders about the massacres, effectively issuing the first "early warning" of an impending genocide. Although Imperial Germany and the Ottoman Empire were military allies during World War I, the Ottoman Turkish authorities responsible for the Armenian Genocide prohibited taking pictures and closely watched anyone suspected of owning a camera. Despite the threat of a court martial, several German civilians and other German military officials assigned to the Ottoman Empire during the war disregarded the ban and secretly photographed the mistreatment of the Armenian population. 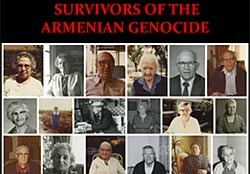 We remember and pay tribute to the survivors who participated in the Armenian Assembly of America Oral History Project. Portraits of 31 survivors, representative of the hundreds who were interviewed, are pictured in the one-page exhibit. We cherish and honor their memory for taking the time to provide permanent witness to the fate of their friends and families, and for sharing their recollections of historic Armenia before its destruction in 1915.